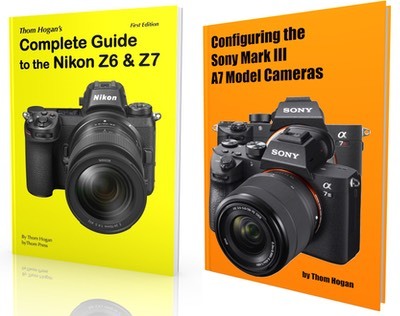 The “System Guides” on sansmirror.com for the various mirrorless mounts have been completely revised and added to: Canon, Fujifilm, Nikon, m4/3, Sony. Thom’s Sony E/FE Bag has been added. Virtually all of the Articles section of sansmirror.com has been looked at and edited. At the request of a fair number of you, I’m going to Tweet the URL for every new article that appears on the byThom sites. Thus, if you follow me on Twitter, you’ll now see in your feed every time I produce a new article. This is in response to those of you who don’t want to continue to use RSS, but want site update information outside a Web browser in a timely fashion. Nothing will change with this site, though: you’ll still see the new articles appear a list of teasers (see This Week’s Articles, above, and Recent Articles, below). A little bit about you: each year at this time I do a deeper analysis of how you’re getting to this site, what you look at, and what you’re using while viewing it. You’re predominately desktop users, with the largest share using the Chrome browser, but there’s fairly large Safari and Firefox participation, too. Internet Explorer users are now down to 10% of my readership. About 20% of you are using the responsive layout of this site by viewing on various mobile devices, and the vast majority of you mobile folk are iOS users (sorry Google). Nikon has extended the lens rebates until January 1st, and added the 35mm f/1.8G DX lens to them (one of my recommended DX lenses). The Software blog has updates for Adobe Lightroom and ACR, Affinity Photo (now also for Windows), and FoCal. (You should go to the Software blog page and click on the Subscribe to RSS feed at the top of the right column [only mobile devices, it will be below the main feed itself]. However, I’ve noticed that a lot of folk are either using browsers that don’t directly support RSS any more, or don’t have an RSS reader. Sadly, RSS seems to be slowly being abandoned, and other content-scraping approaches seem to be pulling at the seams of RSS. I’ve considered becoming Apple News (an App) friendly, but the work to do it right would take away from other projects right now. So for the time being, RSS is the choice for my sites. The Rationalizing Zoom Lens Sets article has been updated. The Choosing a Simple Prime Kit article has been updated. The Reviews pointer page has been updated. Fujifilm announced the X-A10. I reorganized and updated the Meyer-Optik lens and HanDEVision lens pages. I updated all the recent firmware numbers in both the dslrbodies.com and sansmirror.com databases. Posted article about new Capture One Pro version 10 in the software RRS feed. Posted update about Luminar in software RRS feed. Posted corrections to several dslrbodies.com pages.